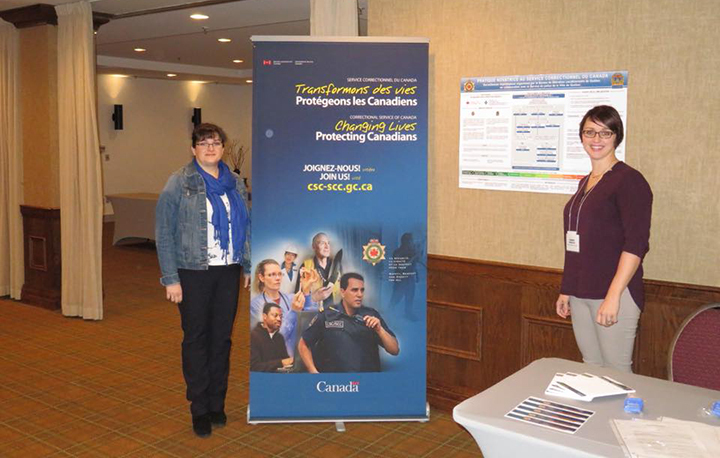 With a scientific poster and Correctional Service of Canada booth, Karine Gingras and Danielle Roy, two employees of the Québec City Parole Office (PO), promoted the organization’s mission at the 38th Congrès de la Société de criminologie du Québec. The event took place from Nov. 8-10, 2017, at the Manoir Saint-Sauveur. It was an opportunity to outline the objectives, outcomes and benefits of an innovative, positive and promising collaborative project between the Québec City PO and the Service de police de la Ville Québec (SPVQ). The project, which was launched in May 2016, consists of impromptu visits by a joint team that includes one parole officer and three police officers. It is aimed at increasing the effectiveness of supervision for all offenders who are serving a federal sentence and who have received a release in the Québec City territory. Reference, file review and prioritization methods, as well as a procedure to follow during visits were developed. The first project assessment is positive for both organizations involved and justifies continuing it. It reminds offenders of the importance of complying with their legal obligations at all times. It also allows the Québec City PO to assess risk based on the observations made at various and unusual times. Thus, the resulting interventions respect the philosophy of the reasonable and necessary measure. For some, the review of the supervision strategy resulted in an easing of the control measures used, whereas for others, more structured interventions proved to be necessary.